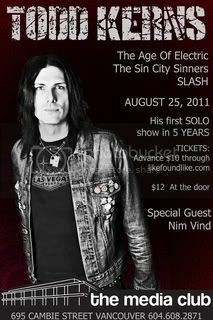 It's been a long time since TODD KERNS - current bass player for SLASH, and guitarist/vocalist for SIN CITY SINNERS, as well as former frontman for AGE OF ELECTRIC and STATIC IN STEREO - walked the hallowed stages of Vancouver, BC. Five years to be exact. Once a staple in Vancouver's rock community, Todd could be seen playing every live music venue this city had back in the '90s with both his bands and his solo project. Then after a decade's worth of live performances and album releases in his home and native land, Kerns disappeared. It's been awhile but with a brief time out from touring the world, Kerns is now bringing a bit of the bad old days back to Vancouver at The Media Club on Thursday August 25th. Getting the band back together, he'll be backed by "The Todd Squad", bassist Squid and drummer Dayvid Swart. And as if that wasn't enough, the special guest and opener for the evening will be local rock mystery NIM VIND fresh off his own successful European tour. Truly a line up for local rock scene appreciators who're ready to kick out the jams and welcome Kerns back to Vancouver. Tickets will be available for sale in advance at likefoundlike.com for $10 or at the door for $12 while supplies last. Get em early!